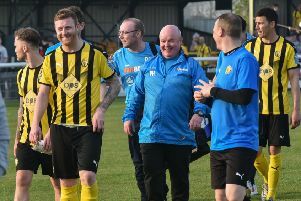 A miserable bank holiday weekend for Brakes ended with them drawing a blank against a limited Bedworth side, writes Paul Okey. The Greenbacks, who had taken just a point from their opening six fixtures, made their intentions clear with former Brake Aron Wint in a lone frontman role ahead of a packed midfield. Brakes, meanwhile, brought in Will Green to replace Rob Ogleby who dropped to the bench as they looked to bounce back to winning ways following Saturday’s last-gasp defeat at Biggleswade. The match kicked off with the PA system still blasting out Latin beats, but that was as close to Samba football as it got with a rain-sodden pitch giving rise to a succession of misplaced passes and poor control. The home side had the first effort at goal in the 16th minute with Lee Moore sliding a difficult volley over the bar after a cross had flicked off the head of James Mace. Jack Edwards headed a Richard Taundry header well over, while Wint had a shot blocked at the other end after Moore was caught dithering. Jack Edwards, already on a yellow card, pleads his innocence after giving away a free-kick. Green was inches away from getting a vital touch to a cushioned Jake Jones volley which flashed across the face of goal and then had a shot deflected for a corner from which Jamie Hood headed over. It was tepid stuff in the main, however, with Tony Breeden dominating possession from almost a sweeping role and the Brakes midfield lacking the guile to break down a well-organised Greenbacks backline. The visitors, for their part, looked every inch relegation- fodder, but while they had a point to hang on to, they remained resolute and the half-time interval brought welcome relief, both from the rain and the game. The second half produced more goalmouth action in the opening five minutes than the whole of the first period, but it quickly reverted to type. Alex Naughton took a diificult ball down on the move before flashing a shot across the face of goal for Bedworth, while Jack Edwards drew the first save from Denham Hinds after picking up a loose ball in the visitors’ box. Daniel Creaney was then off-target for United but this brief flurry quickly blew itself out. A neat Green turn on the right flank was the prelude to a pacy run across the edge of the Bedworth box which gained a free-kick from referee Adam Crysell. Bedworth were incensed, feeling the defender had withdrawn his challenge and Green had dived, with players from both sides getting involved in a heated exchange. When calm was restored, yellow cards were handed out to Kyle Cartwright, Creaney and Edwards, with Connor Gudger wastefully firing the free-kick over from the exact same spot from which Taundry had scored against Kettering. Hinds was down well to pouch an Edwards drive after a neat lay-off from Green and Edwards was to become a central figure in the next five minutes as the match returned to its first-half depths. He was already walking a tightrope having received a warning from referee Crysell for a high boot. Yet he still ploughed into a reckless challenge on the edge of the Bedworth box. His saving grace was that he failed to make contact with the defender and Crysell saw fit just to award a free-kick against him, allowing Paul Holleran to quickly withdraw the midfielder in favour of Michael Williams. The switch actually worked in Brakes’ favour, with Williams pepping up the hosts’ attacking endeavours with a willingness to get on the ball which had been lacking in his team-mates. An overhead kick from the substitute was fortuitously deflected away from goal, while a fierce 20-yard shot flashed wide of the target as Brakes belatedly mounted a spell of pressure. Deep into injury time Williams was again at the heart of the action, driving in a shot which caused anxiety at the back for Bedworth, with the ball eventually scrambled away for a corner as Mackey lurked. The corner, in keeping with what had preceded it, came to nothing. Or should that be nothing, nothing? Brakes: Tony Breeden , Ben George, Connor Gudger, Jack Edwards (Michael Williams, 72), Jamie Hood, James Mace, Lee Moore, Richard Taundry, Will Green (Rob Ogleby, 64), Ben Mackey, Jake Jones (Ross Oulton, 64). Subs not used: Kieren Westwood, Matt Hill. Bedworth United: Denham Hinds, Chris Tullin , Luke Rowe, Andrew Westwood, Kyle Cartwright, Nathan Haines, Mark Albrighton, Chad Degville Cross, Aron Wint (Kristian Ramsey Dickson, 90+3), Alex Naughton (Ben Steane, 67), Daniel Creaney. Subs not used: Ryan Nash, Pierce Kigmbi, Alex Penny.